Outdoor advertising has been the fastest growing traditional advertising medium over the past decade. Spend on outdoor advertising reached £976m in 2007, a little over five per cent of total advertising expenditure. 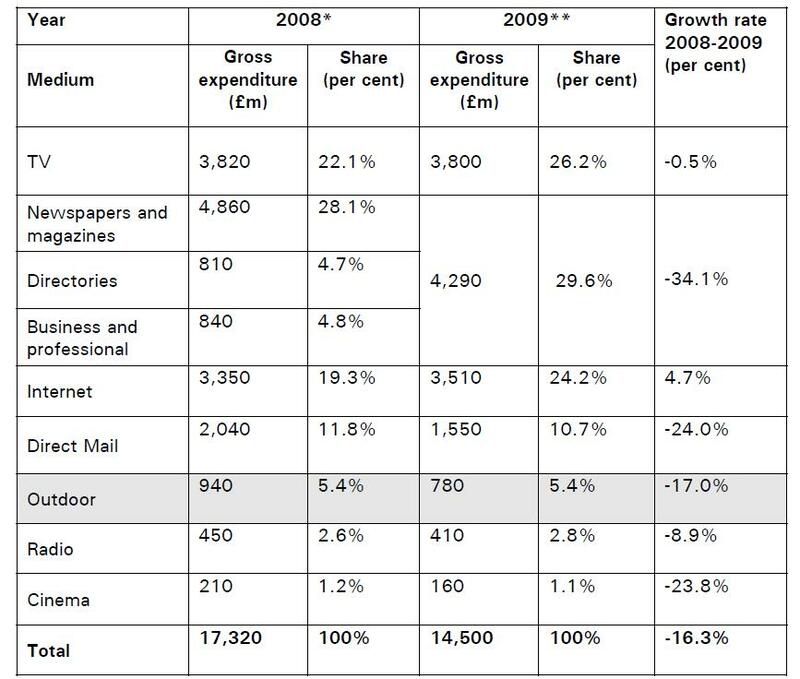 Outdoor spend declined to £939m in 2008 before falling back sharply to £782m in 2009, in line with other advertising expenditure. Outdoor spend has since recovered significantly, with estimated spend of £880m in 2010. Outdoor advertising is provided via a long supply chain. An advertiser typically uses a media agency to plan and buy its advertising campaign, and the agency uses a specialist outdoor buyer for the outdoor advertising component of the campaign. 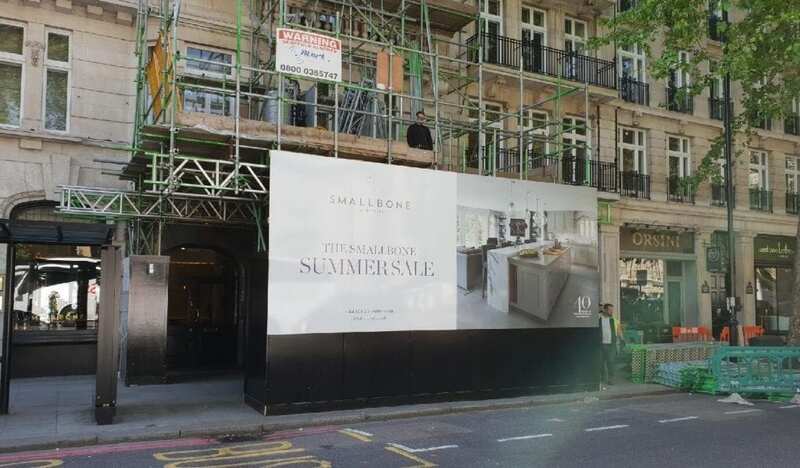 The specialist outdoor buyer then purchases space from media owners who in turn have contracts with site owners to lease the sites on which to place posters. Outdoor advertising in the UK was worth £782m in 2009, representing 5.4 per cent of all advertising. Outdoor advertising has been the fastest growing traditional advertising medium over the past decade. Outdoor advertising, also known as out of home advertising, reaches consumers on the move or consumers in particular environments. Outdoor advertising opportunities are diverse, ranging from very large high impact banners, special builds and large format billboards at the sides of roads through to advertising on bus shelters, in stations, trains, taxis and buses, leisure centres, and in shopping malls and supermarkets. Outdoor advertising (‘Outdoor’) is typically used as one component of a wider advertising campaign that may include television, print, radio, internet and other advertising. Outdoor is often a relatively small part of the overall campaign budget and may complement, for example, a larger television advertising campaign. Outdoor may be used to reach a mass audience quickly or to target specific audience groups in discrete geographic locations. roadside, such as billboards, bus shelters and phone kiosks transport, which covers rail, airports, buses and taxis leisure, point of sale (POS) and retail environments, which include supermarkets, shopping and leisure centres, bars and petrol stations. The choice of environments and formats depends on the audience targeted by a campaign. Innovation in outdoor advertising has led to the rise of new formats such as digital installations. Digital displays including plasma screens account for a growing proportion of the market, increasing from under two per cent in 2003 to more than 10 per cent in 2010. Poster advertising long predates the development of a sophisticated advertising industry. Originally local in nature, the growth of road transport saw the development of poster contractors offering panels over a wider area. The advent of commercial television spurred consolidation of the sector and the formation of industry associations to promote Outdoor as a medium. marketing packages of panels made available by its members to media agencies and advertisers. In 1981 the Monopolies and Mergers Commission published its ‘Report on the Supply in the United Kingdom of Roadside Advertising Services’2 (the MMC report). The MMC report found that complex and scale monopolies of British Posters and its members had restricted competition and had led to higher prices. The MMC recommended that British Posters should be closed. Following the subsequent dissolution of British Posters in 1982, a number of specialist buyers were started by ex-employees. Specialist buyers are not common in other types of advertising. In Outdoor, however, an advertiser wishing to launch a national campaign required the services of a specialist to buy from a very large number of media owners. An important role of the specialist buyers was to ensure that advertising campaigns had in fact been posted. Today, the principal functions of the specialist buyers are to plan Outdoor campaigns and negotiate with media owners. Both the media owner and specialist buyer levels of the sector have consolidated significantly, principally through mergers. Figure 2.1 below illustrates how consolidation has led to the main media owners of today. Spend on Outdoor reached a peak of £976m in 2007, having grown steadily since the dissolution of British Posters. In line with other forms of advertising, it declined to £939m in 2008 before falling back sharply to £782m in 2009. Outdoor recovered in the first half of 2010, with spend up 16 per cent over the equivalent period in 2009. 6 The range given in parentheses is to protect commercially sensitive information. The value of spend on Outdoor has more than trebled in real terms over the past 20 years. Until the late 1990s, Outdoor’s share of total advertising was below four per cent, but has increased since then. Advertisers are businesses that buy advertising and are the customers in the Outdoor sector. Media agencies are distinct from creative agencies. Media agencies are contracted by advertisers to research, plan and buy advertising campaigns. They prepare a strategy for allocating the campaign budget to various media channels, which is subsequently approved by advertisers. There are a very large number of media agencies, including several independents. Specialist buyers plan and buy the Outdoor component of advertising campaigns on behalf of advertisers. Specialist buyers advise on the optimal types and locations of billboards required. Once a plan has been agreed, they negotiate and buy media space from the media owners. The three major specialist buyers are part of media agency networks. Outdoor media owners sell outdoor advertising space. Media owners contract with site owners for the right to use sites for outdoor advertising. 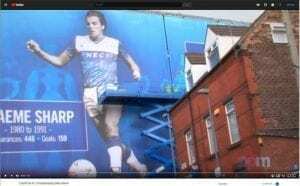 Once there are contractual arrangements in place and planning permission has been obtained, media owners can install advertising panels on sites. Outdoor site owners are the landlords that own sites used for outdoor advertising. They have contracts with media owners and receive rents from them. Site owners may be local authorities, as well as private landlords such as transport companies and supermarkets. • Roadside (around £380m revenue). Roadside includes everything from phone kiosks, six sheets for example on bus shelters, 48 sheets, 96 sheets, and special builds and banners. Transport (around £310m revenue). Transport covers railway and underground systems, airports, buses, taxis, and so on. Some of the contracts for sites are very large, for example the London Underground contract or the Network Rail contracts. Transport can offer longer consumer ‘dwell time’ opportunities. Retail/POS/leisure (around £90m revenue). This sector covers advertising at and in supermarkets, petrol stations, shopping malls, health and leisure centres, and night clubs. It may be used to support price or other promotions targeting consumers in ‘shopping mode’. In general, advertisers choose media agencies through competitive tendering. In choosing an agency, advertisers may narrow their selection by asking agencies to fill out requests for information, holding initial interviews to assess fit, and inviting pitches. Commissions and fees are negotiated. The media agency is responsible for planning and buying across all different types of media, not just Outdoor. Most large media agencies subcontract the Outdoor media component of campaigns to a specialist buyer. Each media agency will have a relationship with a particular specialist buyer. Agencies within groups that own a specialist buyer will generally use that specialist buyer unless the advertiser specifically requests otherwise. Agencies within groups that do not own a specialist buyer, as well as independent agencies. The media agency designs a campaign for the advertiser and proposes an allocation of the campaign budget across different types of media including Outdoor. The campaign strategy and plan is reviewed and subsequently approved by the advertiser. A buying brief for the Outdoor media component of the campaign is agreed between the media agency and the advertiser for the specialist buyer, based on coverage and frequency objectives. The brief specifies parameters for the types and locations of media to be used. It may be revised on an ongoing basis depending on how the relative prices of different Outdoor media change over time. The specialist buyer plans the campaign, selecting specific Outdoor sites or packages of sites from particular media owners. Media owners provide indicative prices to the specialist buyer based on expected future availability during the campaign dates (media owners practice a form of yield management)7. Outdoor space is typically provided in 14day cycles, and one or a number of 14-day periods may be requested depending on the duration of the campaign. The specialist buyer and media owner negotiate provisional prices for specific sites across the specified periods, following which the space will be ‘optioned’ thereby reserving it for a limited time. The specialist buyer will seek the advertiser’s approval before confirming the booking, at which point the price is agreed. Specialist buyers may in addition secure either at or subsequent to confirmation additional value in terms of free space or quality upgrades for particular advertisers. 7 Yield management is a pricing strategy with the objective of maximising revenue for a future period of capacity constrained supply whereby prices are adjusted over time taking into account remaining capacity and anticipated future demand. The campaign runs on the agreed sites for the agreed fortnightly periods. The advertiser pays for advertising space. 8 The media agency is paid an agency commission and the specialist buyer is paid a specialist agency commission (SAC). The advertiser may ask an auditor to audit the campaign. The auditor compares the prices achieved to prices in its pool, adjusting for differences in the quality of media, and also evaluates the composition of the campaign. Finally, at the end of the year, the specialist buyer is paid volume rebates by media owners for the total expenditure it has placed with each over the course of the year. The expenditure placed with each is across all the advertisers that the specialist buyer has represented and is not specific to the advertiser in question. Price setting in Outdoor media is complex. Specialist buyers buy from media owners for individual campaigns according to the frequency and coverage objectives of each particular campaign, rather than buying advertising space in bulk for advertisers or agencies. In most cases, prices are individually negotiated and agreed for each campaign separately, though as mentioned above some large advertisers do negotiate across all their campaigns over a year to achieve lower prices. The specialist buyers may use the fact that they are negotiating for a number of campaigns at once to secure lower prices or additional value such as free space for advertisers. The very large majority of Outdoor media bookings run on a traditional 14-day cycle, although the market is becoming more flexible to take advantage of digital displays. Media owners have a limited supply of space and price dynamically according to their remaining capacity and expectations of demand for any future 14-day period. Prices change continuously and the large media owners provide regular (weekly) updates to specialist buyers on availability for the next few periods. Some also provide indicative prices or price offers. Prices depend on how far in advance the space is booked. We have been told that advertisers buying space well in advance are in general able to buy space at lower prices. However, advertisers may also benefit from lower prices if they wait until near the start date of a display period and there happens to be spare capacity of the type of Outdoor media they wish to purchase. The latter strategy is risky as there is no guarantee that good quality advertising space will be available. Agency commissions are calculated as a percentage of gross revenue. Net revenue received by the media owner is 80 per cent of gross revenue. This is the typical payment structure but there may be minor variations. For example, some advertisers or media agencies may buy direct from media owners. In a minority of cases, the SAC may vary from five per cent and the media agency commission may be outside the two to five per cent range. In addition to the SAC, the specialist buyers receive end of year volume rebates from each of the media owners. Rebates are calculated as a percentage of the total annual spend of a specialist buyer with a particular Outdoor media owner. The majority of rebates are paid according to a tiered structure and apply retrospectively (‘rollback’ rebates). The specialist buyer is paid a percentage rebate, where the percentage is determined by the level of expenditure in increasing tiers. When the next tier is reached, the additional percentage rebate applies to all expenditure rather than just to the incremental expenditure beyond the tier. For example there may be a five per cent rebate for total expenditure up to £20m and a higher rate of 10 per cent for expenditure exceeding £20m and the higher rate applies to the entire expenditure once £20m has been spent, not just to spend in excess of £20m. Volume rebates are generally negotiated annually between specialist buyers and media owners and apply for the course of a calendar year. Rarely, the thresholds for tiers as well as volume rebate rates may be adjusted during the year. This happened in 2009, when Outdoor spend as with other advertising spend was much lower than forecast at the beginning of the year. The structures of rebate agreements and the amounts paid in rebates are considered commercially sensitive by specialist buyers and media owners. We understand that this information is not commonly known to advertisers or even beyond senior executives within the organisations. The Outdoor market can be divided by type of environment, such as roadside, transport, and retail/POS/leisure, and by type of format, such as small versus large format. The views we received on the substitutability of different formats and types of environment varied. While for many campaigns advertisers appear to prefer specific environments and formats to reach their target audience in the right context, some informed us that they considered certain formats and environments to be substitutable for others. The biggest distinction in Outdoor appears to be between small and large format advertising. Most parties suggested that substitution between small and large formats is less likely as six-sheet panels and large formats (48- and 96-sheet panels) typically target different audiences and are therefore used for different purposes. Furthermore, different poster designs are used for six-sheet panels versus large roadside billboards. Six-sheet panels are often used by advertisers as a high-frequency, ‘return on investment’ medium. In contrast, large formats are more typically used for brand advertising, to create impact on sight. For example, one advertiser, which predominantly used large format advertising, informed us that if prices of large format were to rise significantly, it would switch to other advertising media rather than small format. Local or regional geographic coverage can be a useful distinction for some campaigns. An advertiser wishing to advertise in a particular region must use space provided by media owners with a presence in that region. National campaigns may require advertising space in the major urban conurbations for effective coverage.